Here we are at the last week of our Fall season. Again, the weeks seem to have flown by and it’s hard to believe it is almost Thanksgiving! On the farm we have been enjoying the relatively mild weather, and the slower pace of the late season. It has been such a pleasant fall season. Seems like in years past there has been much more freezing weather, sideways rain and near floods! Thankfully, not this year. Many of the end of season tasks around the farm are virtually done. The cover crops are growing, manure has been spread on some of our fallow fields, most of the onions and squash have been sold or sorted, and all the irrigation equipment has been put away till next year. The only exception seems to be our two high tunnels, which still await me to break down what’s left of the summer tomatoes and peppers, roll up the drip irrigation tape, compost and cover crop. It seems to be a dilemma of the season extension, timing the crops so there is actually a break to amend the soil and cover crop. Hopefully, I will get that done this week or next! New this week we have Rapini, Delicata Squash and Parsley Root. Rapini is essentially the Italian equivalent to turnip greens. I read this article last night and thought is was quite a fitting summary as well as a nice recipe. Rapini will keep, wrapped in plastic in the refrigerator for about a week. Parsley root is another vegetable better known in Europe than the United States. This long white root is a member of the carrot family, and looks like a parsnip, but tastes more like celery or parsley. The roots have a strong flavor that lends itself well to caramelizing or adding flavor to soups and stews. Stored like carrots these roots will keep for several weeks. Delicata is the queen of the winter squash in my opinion. They are a nice size, easy to cut and clean, have a thin, edible skin and excellent flavor. Delicata is excellent roasted, caramelized, made into soups or baked into a pie! Most people think they are even sweeter and creamier than butternut squash. This squash will also keep for a long time in a cool dry place, like a pantry shelf. I want to be sure to say thank you to everyone for joining us this season. It has been a wonderful 22 weeks growing food for you. I thought I should also be sure to tell you that we have lots of great produce for sale at the Olympia Farmer’s Market Saturday and Sundays. We have a $22 to $23“Market Special” box each week that is very similar to picking your weekly CSA box. 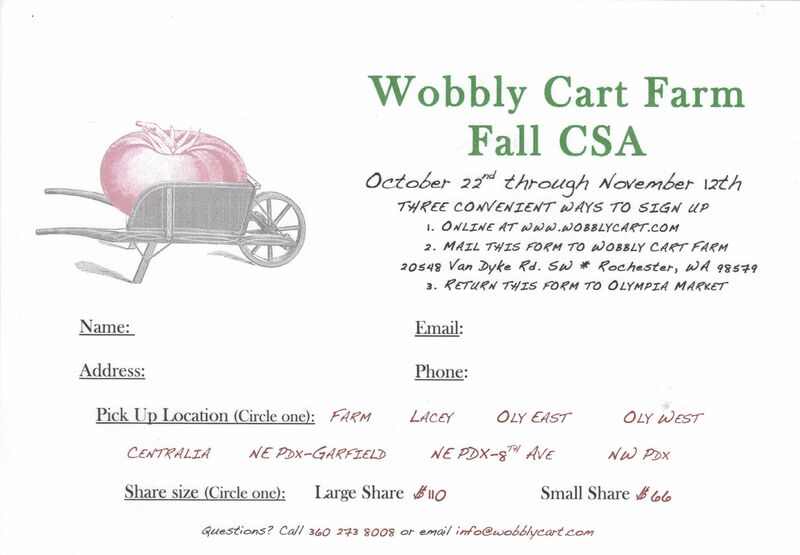 Ask about a discount for our CSA members! We hope you have enjoyed the season as much as we have! Please remember to take care of any balance due on your account, as well as return all plastic CSA boxes to the drop sites! We will be back to pick them up next week! Have a happy and healthy holiday season and we’ll see you next year! Fall Potato Salad: Toss 2 lbs cubed potatoes with salt and olive oil and spread on a baking sheet. Roast in a 450 degree oven for 20 to 30 minutes. Combine with various fall vegetables of your choice; onion, garlic, carrots, roasted winter squash,celariac or parsnips for example. Toss with fresh tomato wedges, basil, thyme or other herbs of your choice. Dress with ¼ cup olive oil whipped with 1 Tbsp balsamic vinegar. Roasted Carrots with Parsnips and Thyme: Preheat oven to 350. Peel and trim 1 lb each of carrots and parsnips and cut them inhalf lengthwise. Large ones can be quartered. Place them on a large rimmed baking sheet. Drizzle the carrots and parsnips with 3 tbsp olive oil and 2 tbsp honey. Season with salt and pepper and toss to coat. Scatter 6 sprigs of fresh thyme on top. After 10 minutes, give the veggies a toss and put back in the oven for another 10 minutes until soft and slightly caramelized. Serve warm. Leek and Potato Gratin: Preheat oven to 375. In a large pot of salted boiling water, parboil 3 lbs potatoes, sliced 1/8 inch thick, for 5 minutes. Drain potatoes well and set aside. In a large skillet, heat 2 Tbsp unsalted butter over medium heat. Saute 10 medium leeks, white and light green parts only, halved lengthwise and cut crosswise into 1 inch pieces (washed thoroughly), and 4 chopped garlic cloves until leeks are tender about 7 minutes. Set aside. In a buttered 9 x 13 inch baking dish, arrange half of reserved potatoes in an overlapping pattern. Pour 1 cup cream and ½ cup milk over the top and sprinkle with 1 tsp salt. 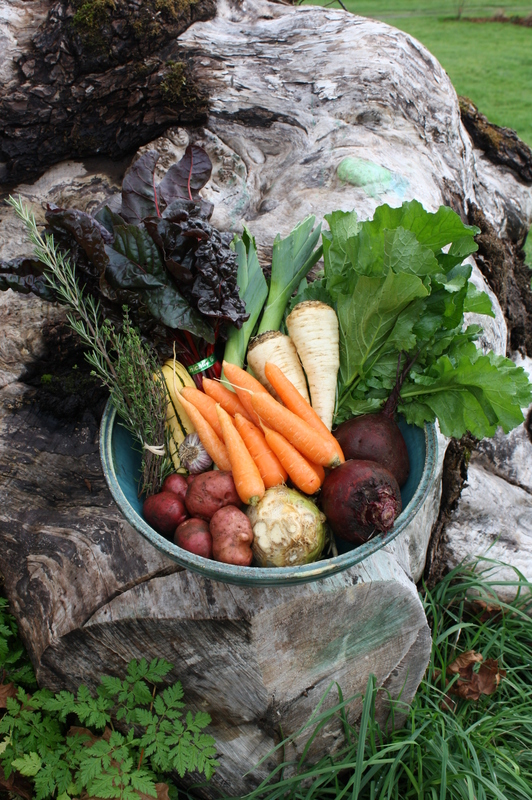 Top with reserved leeks and arrange remaining potatoes. Pour another cup of heavy cream and ½ cup milk and sprinkle with ½ tsp salt. Bake until potatoes are tender, top of gratin is golden brown, and most of the cream and milk have been absorbed, about 45 minutes. Garnish with parsely. Serves 12. From November 2011 issue of Country Living magazine). Delicata Squash with Thyme and Cider Glaze: Peel 2 medium Delicata squash with a vegetable peeler, cut it in half lengthwise and scrape out the seeds with a spoon. Cut each piece in half lengthwise again, then crosswise into ½ inch thick slices. Melt 3 Tbsp unsalted butter in a large skillet over low heat. Add and 1 Tbsp coarsely chopped thyme and cook, stirring, until the butter just begins to turn golden brown, 3 to 5 minutes. Do not brown the herbs. Cooking the herbs in butter mellows their flavor and improves their texture. Add the squash to the skillet, then 1 ½ cups unfiltered apple cider or juice, 1 cup water, 2 tsp sherry vinegar, 1 tsp salt. Cook, stirring occasionally, over medium heat at an even boil until the cider has boiled down to a glaze and the squash is tender, 20 to 30 minutes. Taste and season with pepper and additional salt if needed. ( from The Herbfarm Cookbook by Jerry Traunfeld).